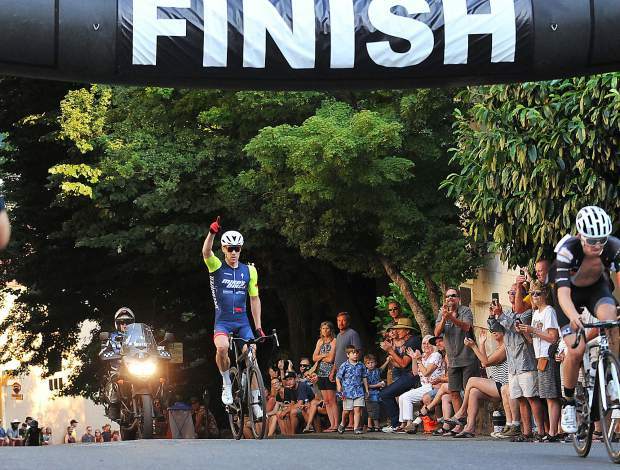 Nevada City Classic Men's Pro Race winner and Mike's Bike's team cyclist Chris Riekert crosses the finish line with a sizable lead over second place during Sunday's race. 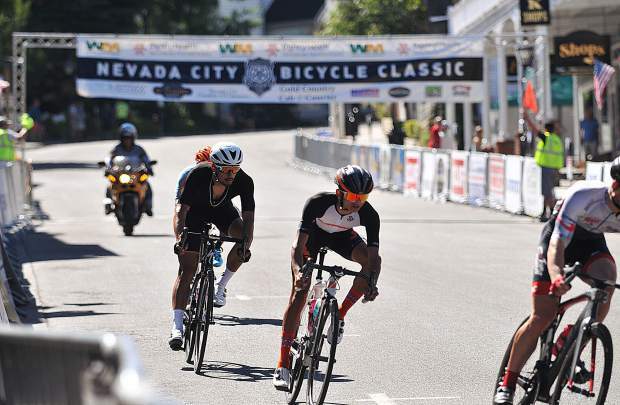 Women's pro race winner Lisa Cordova crosses the finish line first while Amity Gregg and Ellie Velez follow close behind for a second and third place finish during Sunday's Nevada City Classic bicycle races. 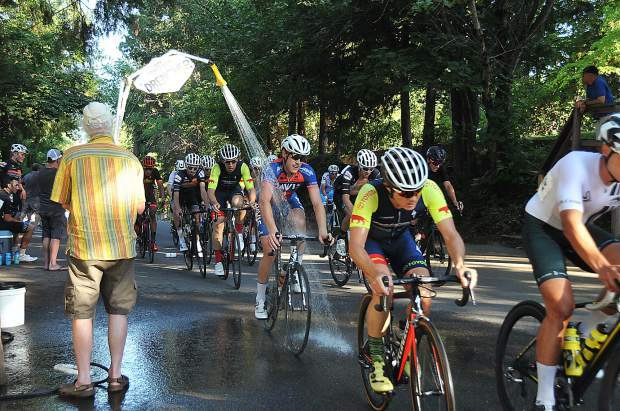 Men's pro race cyclists pass under the drencher at the top of the Nevada City Classic course. 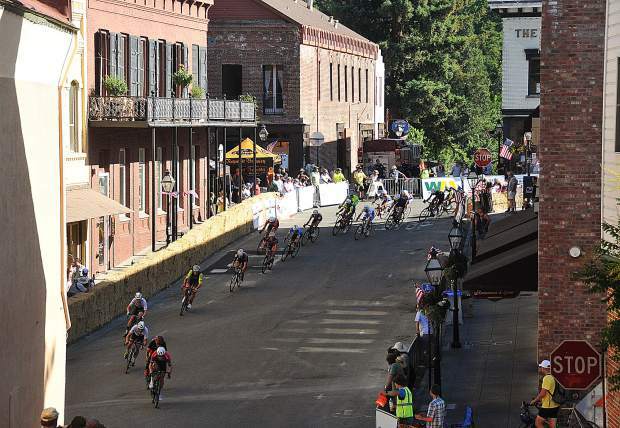 Racers make the turn down Broad Street and onto Pine Street during Sunday's races of the Nevada City Classic. A cyclist makes his way down Broad Street while the peloton of riders is close behind. Racers make their way down Broad Street before turning onto Pine Street towards the Nevada County Courthouse. Cyclists zoom along Pine Street after coming down Broad Street with downhill speed. Mens Pro race podium winners are Chris Riekert in first, Aria Kiani in second, and Robert Skinner in third. 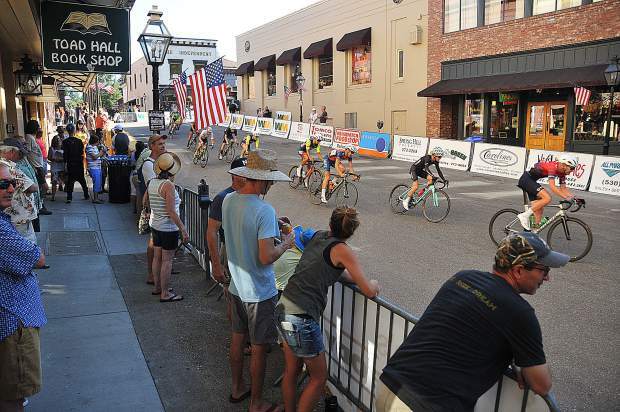 The crowds showed up, the riders competed, and the 58th installation of the Nevada City Classic went off without a hitch Sunday on the streets of downtown Nevada City. 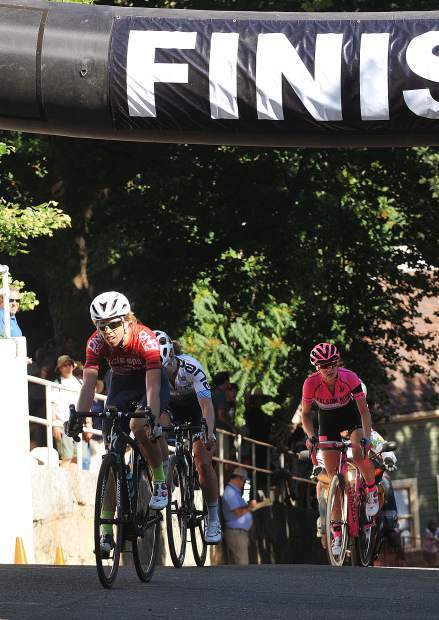 Two major changes to this year’s race — pushing the event back a week and reverting to the original course — left some wondering if the second oldest continuously operating bicycle race in the country could bounce back from last year’s dismal attendance. “We’ve got a lot of improvements to make but the crowds were about double from last year even with the heat. 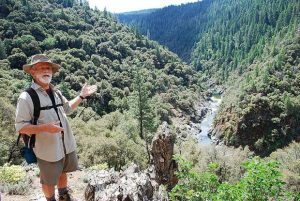 The racers were double from last year, even with the heat,” race organizer Duane Strawser said following the event. 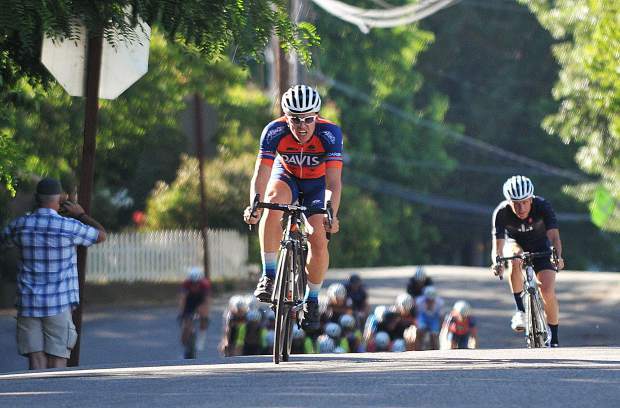 Forty-one registrants took part in the men’s pro race, while 12 pro women riders competed against each other on the Nevada City course. 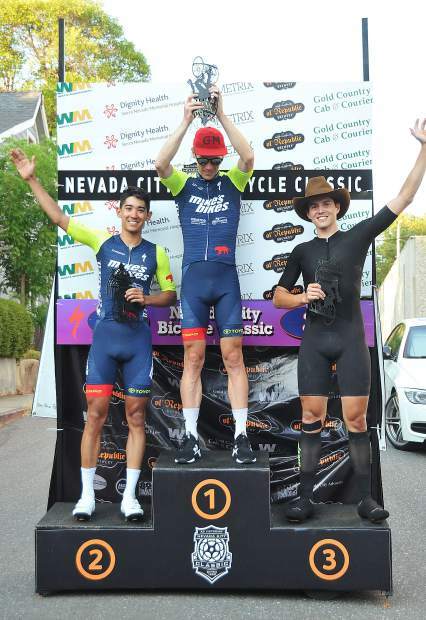 First place men’s pro race cyclist, and Mike’s Bike’s team rider, Chris Riekert was elated to take the top spot on the podium. “This race, for me, when I first started racing was such a big deal,” Riekert said following his win. Fellow Mike’s Bike’s team rider Aria Kiani took second place on the podium, while Robert Skinner out of San Jose took third place. Women’s pro race winner Lisa Cordova from Chico took the top spot on the podium, while Amity Gregg of San Francisco took second. 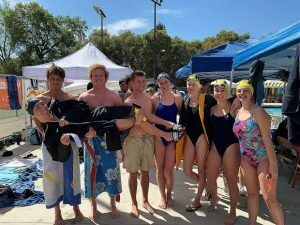 Ellie Velez of El Dorado Hills took third place. 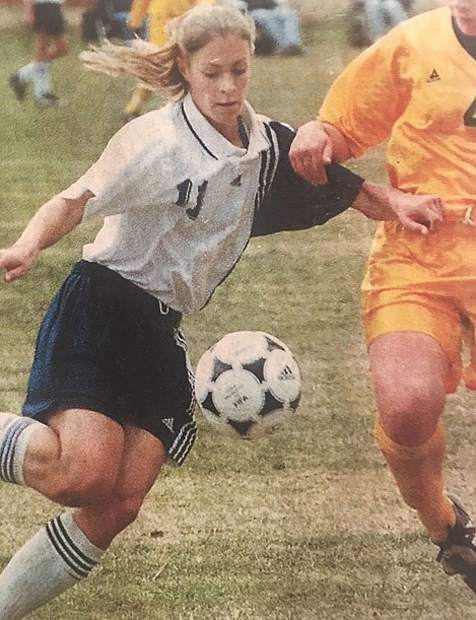 Whether or not next year’s Nevada City Classic will occur on the weekend following Father’s Day again, remains in the hands of the Nevada City Chamber of Commerce according to Strawser.